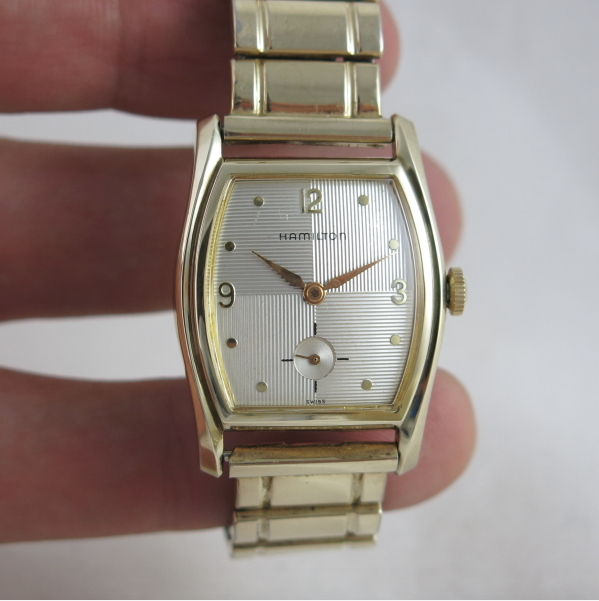 Over the 50 or so years that Hamilton made wrist watches in the USA, they issued different models with the same name as earlier models... sometimes more than once. For example, there are multiple watches named Scott, Drake, Essex and many others. At the same time there are lots of common men's names that were never used, like Joseph, William, and David. Watches that share names usually have nothing in common with their predecessors other than their name. One exception to the rule is the 1957 Grant. It looks to be a 1950's version of the 1934 Grant with a more modern flair. Not only are the similarly shaped, both Grants were only made for two years. 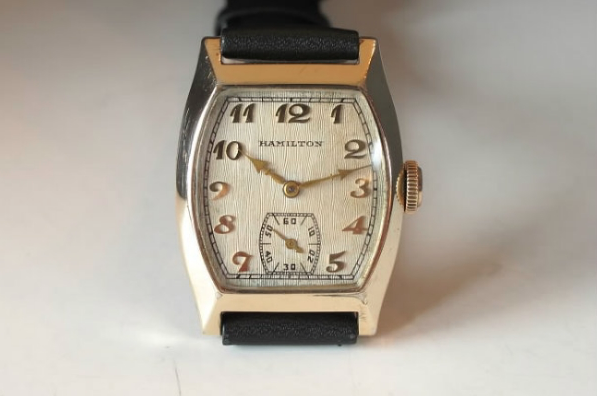 The 1957 Grant was part of Hamilton's Fine Men's Watch line - their entry level models. 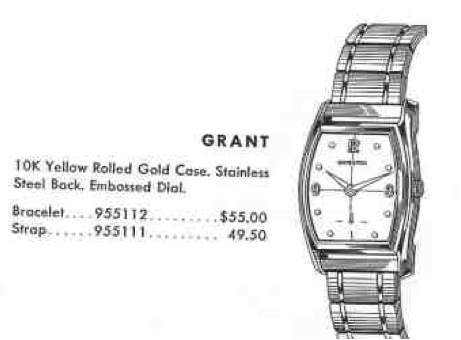 Like most of it's peers in the "Fine Line", the Grant features a 17 jewel Swiss movement, in this case a 673 movement. The case is 10K rolled gold plate with a stainless steel back. The most distinctive feature of the Grant is the grooved quadrant dial and recessed seconds register. These are details that don't show up in the Hamilton catalog's artists rendition. I recently picked up a Hamilton Grant with what I believe to be is the original bracelet too. The bracelet is very similar to the catalog image, although one could wonder is the black spots in the bracelet links is a feature that my bracelet lacks. Personally, I'm of the opinion that the artist took a little creative license with the drawing and chose to add features that don't exist and hide features (like the dial) that do. Regardless - I think it's a pretty attractive looking watch. And just for comparison's sake, here's a 1934 Grant so you can see the similarities.